This letter was published in PM on December 1, 1942, page 21. 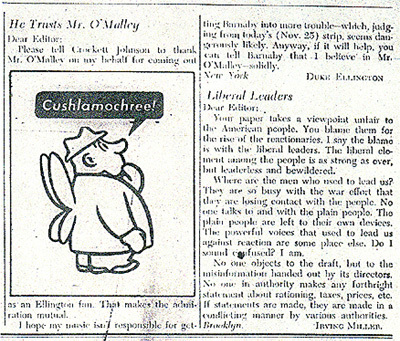 In the strip to which Ellington refers, O'Malley and Barnaby are at the radio station. O'Malley says, "Give ear to the strains of this Duke Ellington opus, m'boy . . . Sizzling but solid -- as we cognizant felidae say --"
The comic appears in both Barnaby (1943) and Barnaby #1: Wanted: A Fairy Godfather (1985).